On Tuesdays, we meet at the Donald S. Dobrosky Sr. & Katherine O. Johnson Community Resource Center in Tecumseh. On Wednesdays, we meet at the Pittsfield Union Hall in Ann Arbor. Please arrive early to class. That way, we can get setup, start timely, and maximize the time we have to play together! Please also keep us informed of any planned absences so that we don’t worry. Tuition is $45 per class each month for student learners. Parents, grandparents, and guardians can learn alongside their student at $15 per class each month. An example: a student signed up for band pays $45 each month and attends all the weekly band classes they desire at any location (either or both) for that month. In another case, a student signed up for band and orchestra pays $90 each month and attends as many 2-hour, weekly classes as they desire at either or both locations. When available, NHME's instruments may be rented for $15 each month. Tuition is due at the beginning of each month or payable by lump sum at the beginning of the semester or term. When available, payments can be made securely online via credt card or PayPal. The 2019 start to the second half of our 19th season will begin on Tuesday, January 8th, in Tecumseh, and Wednesday, January 9th, in Ann Arbor. is a class not offerred at that location. is a class as yet to be determined and awaiting sufficient enrollments. We do occasionally experience snow days where classes have to be cancelled. In such an event, notifications will be made via group email messages, posts to our Facebook page, and tweets from our Twitter account (@NHMEorg). In addition, if the local public schools (Tecumseh or Ann Arbor) close due to bad weather, NHME will also cancel classes. We hold a Winter Concert performance every year during the second week of December at Milan Middle School auditorium in Milan. This year, our concert date is December 12, 2018. Should that date change, we will notify everyone by email, Facebook post, and in-class announcements. Performance time is 7:00pm. Call time will be announced in class. We also hold an annual Spring Concert performance the second or third Tuesday in May at the Tecumseh Center for the Arts in Tecumseh. This year, our concert date is May 14, 2019. Should that date change, we will notify everyone by email, Facebook post, and in-class announcements. Performance time is 7:30pm. Call time will be announced in class. Performers' attire is standard concert dress: white on top, black on bottom. All performances are free of admission as a service to our families, friends, and supporting communities. Unlike some ensembles, attending private lessons is not a requirement to participate in NHME's activities. While some choose private lessons in addition to playing with our group, the majority of our students do not study privately and still perform at a competent, early-college level. NHME does not discourage private lessons, however. A student learning with us and studying privately is going to get good fast! If one has to choose between learning in an ensemble setting or learning solo on their own privately, choose ensemble learning — it's much more fun and rewarding together! Some instruments have steeper learning curves than others when first starting out. Private lessons can be useful in helping a student get over those initial hurdles. There are also some instruments that we do not as yet teach such as piano or guitar where private instruction would be the way to go. Having been in the community and involved in the musical scene for over 18 years, we’re well connected and networked. We can recommend some great private teachers. Give us a call or check out our links page. NHME holds two, week long, camp-intensive experiences each summer. 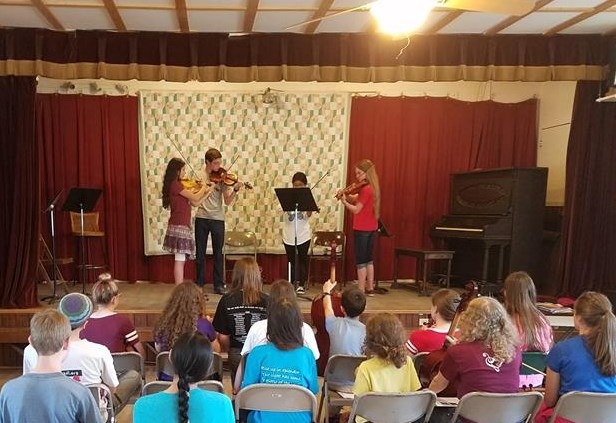 Strings' Camp is the first full week in June, 6/3/19 to 6/7/19. Band Camp is the third full week in July, 7/22/19 to 7/26/19. Camp starts at 9:00 am, has a break mid-day with a provided lunch, and concludes each day at 3:30 pm. Camp tuition is $100 per student for the week. Listen to announcements in class for further details. Submit an online enrollment registration on our secure site, and you're all set! Our rehearsal halls are easily accesible by major roads from all around Southeast Michigan. Our students hail from Lenawee, Monroe, and Washtenaw Counties. Ample parking is available onsite. Browse our support and questions page for more information. Download a new member handbook as well. 16 hours of expert instruction is available to a student each month per class. That amounts to $2.81 / hour. Compare our costs to the price of private music tutors (on average $65 / hour), and we see why NHME is so popular and growing! Give us a call, send us a message, or even arrange a visit. We would be most happy to respond! Find out more about the organization, its founders, and our highly qualified instructors. Countdown to the Spring Concert! Student musicians who already have a musical background from another program or private lessons are encouraged to join us. Parents / guardians are invited to learn with their student musicians by taking up the instrument of their choice. Adults who are currently musicians are invited to join with either the beginning or advanced group. Grandparents, retirees, and senior musicians who would like to share their musical experience, strength, and hope with a new generation are most welcome indeed! Let the Science remove all doubt! "Play and enjoy music while you are young; and when you are old, pass it on."